That’s the title our electricians have earned because of the artful and efficient manner in which they “snake’” electrical wiring through existing walls. These guys have spent their professional careers magically running cable in places where others say it’s impossible. And if they do need to make a hole in your wall… THEY PATCH THE HOLE!! So there is never surprise patching needed. I can tell you from experience that 99.9% of the electricians out there don’t have the same track record! Most electrical contractors are clueless about snaking wires because the majority of their work is in new homes before the walls go up. Let one of them (or the cable guy) run wiring in your home, and they’ll most likely staple it along a baseboard (ugly and unprofessional) or punch a hole in your wall and leave you with the hole to patch. On the other hand our guys are masters at hiding wires. Microwaves–Most kitchens in older homes do not have the wiring required to power a microwave oven. The new fashion in microwave ovens is the over the range type. We see many of these wired using the existing exhaust fan wiring. This is a definite problem waiting to happen. Call Mister Electric and we will get your microwave properly wired and mounted. Window Air Conditioners– Require a dedicated circuit to properly power them. We see many people who have problems with circuits blowing fuses or tripping breakers who were told by a salesman that they could “just plug it into any outlet. Call us today and we will have you cool tonight! Dryers and Washers— Require dedicated circuits wired straight from your electric panel to the unit. Today’s dryers require 4 wire circuits, outlets and cords. Call Mister Electric to get your appliance’s up and running today! 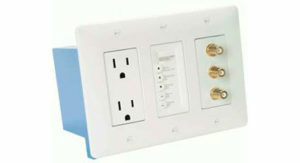 Dedicated Computer Outlets– With the amount of important information we all store on our computers, it make perfect sense to have a dedicated outlet for their use. We have met many clients who have had their computer plugged into a general purpose outlet when someone else in the home turned on a plug in heater or blow dryer and the circuit tripped and they lost hours of work or worse suffered a hard drive crash! Flat Panel TV’s–The In-Wall Power Center provides a safe power source for your wall-mounted flat-panel TV, as well as a simple solution for cable management. It features two surge-protected AC outlets and includes a power conditioning module to minimize the electronic noise that can affect your TV’s performance. Hot tubs–When we wire your hot tub you can be assured that it willbe wired to meet or exceed all electrical codes. We come across hot tubs wired by some guys that are a genuine disaster waiting to happen. A hot tub has the potential to become an electrified tub of water if not installed correctly. Make sure you hire an electrician that will do the job RIGHT! It will have proper GFCI protection and be safe for you and your family to enjoy for years to come.